Despite the Auckland Housing Accord delivering 154 Special Housing Areas that are supposed to deliver more than 60,000 new dwelling sites, since it was ratified in October 2013 the median Auckland existing house price reported by REINZ has increased 45%, the median Auckland section price reported by REINZ has increased 52% and the cost per sqm of new dwellings in Auckland has increased 36% based on the consent data. On its own the Accord was not expected to deliver a massive reduction in new housing costs while much of the supply increase resulting from it is yet to reach the market. It is too early to assess the impact the Accord will have on housing affordability. National has implemented and is working on other means of improving housing affordability. However, I am sceptical of how much the Accord and other initiatives will improve affordability especially in light of the massive deterioration since the Accord was ratified (i.e. 10 steps have been taken backwards before one step has been taken in the right direction in terms of actual affordability). It is no surprise that Labour is promoting additional policies aimed at improving especially Auckland housing affordability and that housing affordability will be a major election issue. The aim of this Raving is only partly to fuel the important debate about housing affordability but it is more so to provide a benchmark against which to assess future progress. What new housing is selling for, which includes section/land costs, building costs, developer margin, council and other compliance costs, etc., is where a benchmarking exercise should start. Consequently, the majority of this report provides insights from more than 300 house and land package deals advertised for sale in Auckland on the websites of seven major building companies. This is the first of what is planned to be a twice annual report that will review progress with new housing affordability in Auckland. While the real value will be provided in future reports that map progress with affordability, the analysis of the house and land package deals in this report provides some interesting insights. For example, it reveals massive differences in what each dollar buys in different parts of the Auckland region. The future reports on Auckland new housing affordability will only be provided to clients of our regular pay-to-view reports. I would like to thank Denise for the hours she spent obtaining the detailed information on each of the 300+ house and land package deals. The Auckland Housing Accord was ratified between the Minister of Housing Nick Smith and the Auckland Mayor Len Brown on 3 October 2013. Following that and up until September 2016 when the original Special Housing Area legislation expired, 154 Special Housing Areas were approved that had the potential to deliver around 60,000 additional new dwelling sites. The Housing Accord was supposed to "result in increased housing supply and improved housing affordability" although it was recognised that "improving the affordability of housing is a complex issue and requires consideration of wider issues, not all of which will be able to be addressed under this Accord". Since the Accord was signed the median Auckland existing house price reported by REINZ has increased 45% based on the rolling three-month average that is used to smooth volatility in the monthly median price caused by changes in the composition of sales (blue line, left chart). By contrast, over the same period the average of the median prices reported by REINZ for all other regions increased a relatively modest 27% (black line, left chart). Consequently, the Auckland median price increased from 1.66x the median in the rest of the country to 1.99x (right chart). Since the ratification of the Accord the median Auckland section price reported by REINZ has increased 52% based on the rolling six-month average that is used to smooth the at times extreme volatility in the monthly median while the average of the median prices for all other regions increased only 22% (left chart below). Over the same period the average square metre cost for building new dwellings in Auckland increased 36% versus a 19% increase in the rest of the country based on the rolling 12 month averages (right chart below). Some caution is warranted in interpreting the REINZ median section prices especially for Auckland because only a small portion of sections consumed in building are sold via real estate agents. The appendix has a map that shows the locations of the 154 SHAs and a link to information on individual SHAs. Most of the supply response driven by the SHAs is still to reach the market. This means most of any impact the SHA will have on housing affordability still lies ahead. Just prior to the expiration of the SHA legislation in September 2016 it was extended by three years meaning more SHAs will be approved in the future. In August 2016 we released a report to clients that reviewed progress with 31 of the 63 SHAs approved in the first three of the 10 tranches of SHAs with the insights based on on-the-ground research we did in late-July. 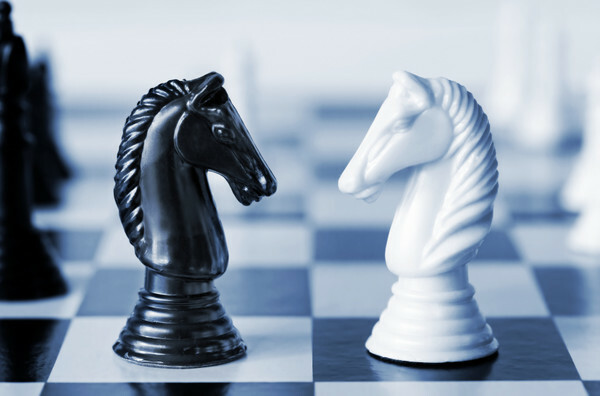 More progress has been made with SHAs since then although recently a general tightening in lending criteria by major banks appears to pose a threat to progress for property developments that is likely to include some if not possibly quite a few SHAs. The supply increase may fall well short of what was hoped for by the authorities over the next year or so but even with a more significant supply response it is questionable how much just increasing supply will improve housing affordability. The extent to which section prices and new housing costs have increased since the Housing Accord was ratified means 10 steps have been taken backwards in terms of improving Auckland housing affordability before any progress has been made in getting down new housing costs. The National Government has introduced a range of other initiatives although I am sceptical of how much and/or how quickly they will improve Auckland housing affordability. Labour's proposal to scrap the urban limit and debt fund infrastructure for new greenfield and brownfield residential developments potentially offers much more hope of significantly improving Auckland housing affordability while the same issues are relevant to various degrees to most major urban centres. New Zealand lacks some of the statistics that are available in some large countries. In the US, for example, statistics are available on the number of new house sales and on national median prices for new houses. To help overcome the shortcoming and be able to monitor what is happening at the coalface with new housing costs in Auckland we have started a survey of house and land packages for sale on the websites of seven major building companies. Thankfully for virtually all the house and land packages the seven companies advertised for sale they have details in addition to listed prices, including house size, land area, number of bedrooms, number of bathrooms, number of lounges/living areas and suburbs. These details are important to ensure we compare like with like when we monitor what is happening to new housing costs in Auckland in future reports. The details also provide useful information that can be analysed straightaway that reveals a number of interesting insights as presented below. Denise found 337 new house and land packages for sale with seven major building companies in a late March survey. Once I removed properties that didn’t have all the information required for the analysis and those that were lifestyle or pseudo-lifestyle properties it came down to 314. These properties were spread across the Auckland region with the majority in new subdivisions but some not. Location is an important factor in land values. To make sure the conclusions weren't distorted by location the focus was narrowed to the areas where there were more than a few house and land packages for sales. This narrowed the list to Beachlands, Glenbrook, Glenn Innes, Helensville, Hobsonville, Huapai, Long Bay, Papakura, Pokeno, Pukekohe, Silverdale and Whangaparaoa. 280 of the house and land packages were in these 12 areas. The properties were largely standalone houses but some were townhouses. None were apartments. The adjacent chart shows the average listed prices for the house and land packages in each of the 12 areas. Prices were generally lower in the towns surrounding Auckland city proper (i.e. Glenbrook, Helensville, Pokeno and Pukekohe). 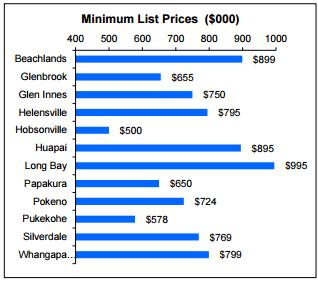 The left chart below shows the lowest list price for any house and land package in the 12 areas. While average list prices in Hobsonville were a touch over $1 million it also offered the cheapest properties at $500,000 but they were 85 sqm dwellings on 121 sqm of land. A key feature is a complete absence of genuinely affordable new housing for the average first home buyer, lower or even lower to middle income earners. For the total 314 house and land packages there was a quite strong tendency for list price to increase with house size although the variation around the trend line was significant (left chart below). 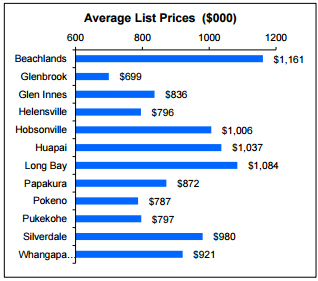 Pukekohe had the most house and land packages for sale at 73. 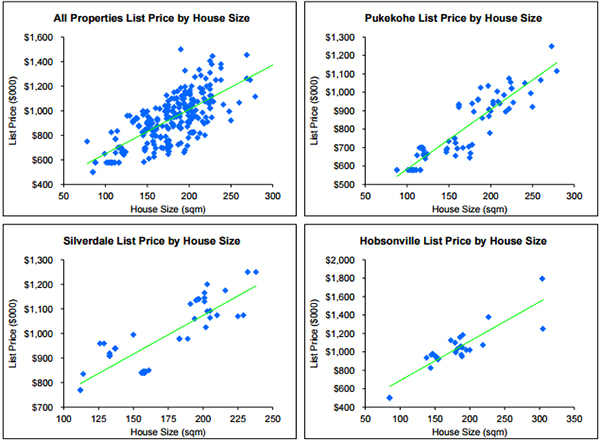 The right chart below shows a pretty strong tendency for list price to increase with house size for Pukekohe. Silverdale had the second highest number of house and land packages for sale at 49 and it also showed a pretty strong trend for list price to increase with house size as shown in the second left chart below. And it was a similar story for Hobsonville where there were 33 house and land packages listed for sale as shown in the bottom right chart. It was a similar story in the other nine areas although for some of them there weren't many house and land packages listed for sale meaning it is questionable whether the sample sizes are large enough to draw firm conclusions. This is especially because in some of the other areas only one or two of the seven building firms had house and land packages for sale. To some extent the building companies have their own niches meaning the houses they build may not be entirely representative of what gets built in the area. There wasn't a clear relationship between list price and land area for the 314 house and land packages (left chart below). But when the three areas with the most house and land packages for sale are considered the trend lines are more clearly upwardly sloping although there are still reasonably significant dispersions around the trend lines (other three charts below). 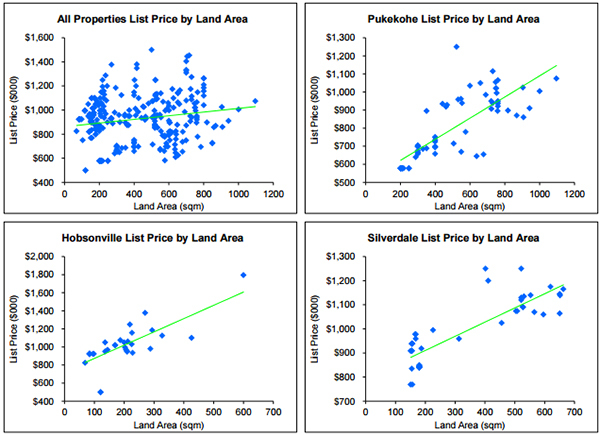 Location can have a dramatic impact on land prices while building costs should be similar across the Auckland region albeit in some areas higher specified houses will be built meaning higher building costs per square metre. It therefore makes sense that across the whole Auckland region there isn't a clear relationship between land area and list price but equally it makes sense that there are clear relationships for the various locations. The adjacent chart provides an interesting insight into what you get for your money in the 12 areas. It shows the average price per square metre of house size plus land area. 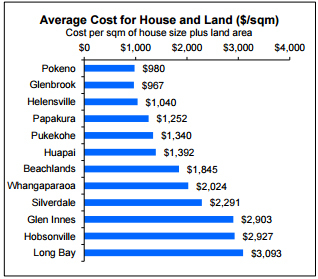 For example, in Pokeno the average house size was 190 sqm, the average land area was 615 sqm while the average list price was $787,000. This meant an average house and land area of 805 sqm and an average cost per square metre of house and land of $980. By contrast, in Long Bay the average house size was 178 sqm, the average land area was 179 sqm and the average list price was $1,084,000. This meant an average house and land area of 357 sqm and an average cost per square metre of house and land of $3,093. If you calculate the average cost per square metre of house and land from the average list price and average house and land area quoted for the two areas above the outcome will differ somewhat from the numbers I have quoted for the average cost per square metre of house and land. This is because I have calculated the average cost per square metre of house and land for each property and then taken an average of that. It is the nature of maths that calculating the average cost per square metre of house and land on a per property basis will provide a somewhat different result. There will be reasons why the comparisons in the chart above are somewhat misleading. For example, of the 33 house and land packages we found for sale in Long Bay they were related to two building companies that were offering more compact housing options that may not be reflective of the overall Long Bay market. The quality/cost of building finish and materials can differ significantly. There are also issues around combining the house size and land area because the actual or implicit price per square metre of house will vary significantly from the per metre price of land. But even allowing for such qualifications the chart above suggests people buying new houses in the towns surrounding Auckland city proper are getting significantly more house and land per dollar. This compares with the average list prices that don't show such large disparities (see the bottom chart on page 3). The two charts below show the average house sizes and land areas for the 12 locations. Land area tends to differ more than house size although Glenn Innes is something of an exception with lower average house sizes although there were only six properties involved with one building company. Helensville and Whangaparaoa differ somewhat in terms of average number of bedrooms while Whangaparaoa is the main standout in terms of average number of bathrooms (two charts below). There are moderate differences in terms of the average number of parking spaces and the average number of lounges (two charts below). Where a property had a separate family room it was counted as a second lounge. Parking spaces may be somewhat arbitrary in that most relate to garage spaces but it appears that some relate to spaces for off-street parking. *Rodney Dickens is the managing director and chief research officer of Strategic Risk Analysis Limited. Excellent idea to provide this baseline. Good effort! "Labour's proposal to scrap the urban limit and debt fund infrastructure for new greenfield and brownfield residential developments potentially offers much more hope..."
Be extremely sceptical of this policy ever being implemented. Len Brown (Lab) and Phil Goff (Lab) have had 7.5 years in which to implement this policy or something similar, but have done the complete opposite. Town planning in Auckland is power that Labour has held for 7.5 years and look what they have done to this town. Yep.Brown's legacy: huge rates and debt increases and NO new bus lanes. Perhaps the 100's of thousands of immigrants should have been asked to bring some new bus lanes with them. A mayor can't just magic this infrastructure up. This financial and lifestyle disaster is not Len Browns legacy, It is John Keys legacy. FYI - here is the current bare land pricing in Australia. On the supply side of needed housing reforms I think Glaeser is getting near the truth with his analysis. Where he looks at how regulations distort the cost of production for new housing. Also Rodney is right. National have been hopeless on housing -that is what you get when you spend 9 years in power denying there is problem -despite campaigning in 2007 that it was a problem. All the measurable housing statistics are worse than 2008 when National came into power and worse than 2013 when Nick Smith became Housing Minister, as Rodney shows. Labour has some new policy ideas around housing and infrastructure. They also appear to have the political will to address the housing crisis. If housing is an issue that concerns you -then in my opinion Labour would be the better bet vote wise in September. And the same criticism and resolution could be levelled with respect to environment and water quality. Absolutely. They have made a behind closed doors decision to sponsor dairying and mining at the expense of trashing the environment. They know all too well this trade off, but just like housing, have denied denied denied and lied..
All done to satisy their short sighted greed - and to hell with anybody and anything else. How anyone can defend such dismal guardians of our lands and future is beyond me. Yep Kate and Rastus it is a disgrace. As a thought, maybe the needy are quite happy living in motels so even though they can't afford to buy a house, they'll happily vote National because Bill and co are using the countries taxes to put them up somewhere that they wouldn't usually be able to afford on a holiday..But at the same time the average person in this country is getting ignored. The only ways that the Irrational Party looks after people is either to be super rich with your own home and a rental or two (and reap the systems tax benefits) or be so poor that you get put in a motel or live off subsidies. Find yourself in the middle and it's one of two choices: Become a slave to the bank or become a slave to your landlord. Sweet country this... Being in the middle it feels like you're being stretched...either sell out your values and chase the money by becoming a capitalist bully (a state of being that I think John Key has really fostered in this country). Or just completely give up and say f it - I'll go and live in a motel at the expense of the tax payer. So perhaps it's dairy farmers, landlords and the needy that are all voting 'Irrational Party'. I don't see why average joe would want to vote for Bill and co. It's like there is some type of dominant/submissive relationship between Irrational Party and its voters. 'Whip me some more please' - 'thank you'. And the more I think about this, Irrational Party are fostering a class system. If you want to become a capitalist bully great - we'll provide the environment for you to flourish. Result being the few take from the many and the masses end up with less to the point where they can no longer function in society through their own earning. Then Irrational Party say to the poor that are being bullied by the capitalist cronies, here we're the good/nice guys, have some money to pay the landlord or here's 5 nights in a motel, but come Sunday you're going back to the car. It's incredibly two faced leadership. It makes me feel a little sick to think about the harm this is doing to our society (that I think used to be great - now, not so much). I think in part it's because young Kiwis have not yet connected the dots between National's policy and actions and the fact they'll likely never own a home in their city of birth (Aucklanders, at least). The lack of quality journalism in many mainstream sources - or their beholdedness to advertisers - seems to have prevented them holding the government to account for this ridiculous housing crisis now present in Auckland and the wider country. Rick.....and Australia,,,, and Canada,,,,, and all the rest that have major housing problems....do you not suspect that if they were really smart they'd be joining the dots to figure out that there's a far bigger problem here that is much more global than one specific Govt? That's correct Grant - I agree with you. It's not Nationals fault. But National have been encouraged to maintain status quo by dimwits (about 43% of voters) who think that expensive houses, high debt levels, clogged roads, hospitals and schools are all signs of success. In reality, they are signs of failure. Why not have cheap houses, low debt, and easy living with only moderate stresses on our infrastructure? Now that would be something to celebrate. You mean, other markets where politicians have also used terms like "xenophobia!" to silence discussion around the role of foreign buyers in the market, for example? Check out some of the articles covering Vancouver to see exactly the same sorts of things have been happening there as here, with just as intransigent a government. By most of NZ Grant you mean 43% in recent polls -so not most. What you mean Grant is some NZers still believe the govt spin... that Bill and co have delivered a brighter future. That problems such as the housing crisis, rampant immigration and overloaded infrastructure are actually the reverse -signs of success. Well Grant you are probably right there are a significant number of such deluded NZers, but like your fellow ilk -you added a bit of spin. Because it is not most NZers it is only some. I dont think they look at the economy, I think they look at the paper value in their house and are so stoked to be a default millionaire they see no evil. They vote with personal greed. Well said Grant - the same left wingers slobbering over their keyboards forget the solid job that the government did to steers us through the GFC. God help us if a Labour coalition had been in charge then, and as the world enters another phase of great uncertainty, the same applies for the future. I agree. We need clear heads and solid experience. Tweak the immigration settings and make as few law changes as possible. Where does this fallacy come from Smithy? National took over from a Labour govt that had set up Kiwisaver and the Cullen Fund as well as reducing govt debt dramatically. Under the "astute management" of Key, National gutted Kiwisaver and the Cullen Fund, foolishly sold off the family silver, reduced taxes and increased govt debt several fold. What they have done is preside over a transfer of weath to the rich and ripped apart NZ society with its Ponzi immigration / housing economic ideas. Smithie - good point on the GFC. Why do you think JK has jumped ship now? Remember he's a narcissist. Why did JK jump ship ? It humours me that people think JK guided NZ out of the GFC. It's like the idea that an individual CEO has a significant influence over company performance. There's little to no proven correlation, perhaps some marginal influence. Good point Grant - no you don't. You go out and buy and sell expensive houses to each other. Why do you think our economy is performing so well? I'm significantly worse off now compared to 10 years ago when I compare the cost of living to income. How is this something to sit back and admire? Think you might have drunk too much of the kool aid. If wages had increased a lot compared to cost of living, absolutely, let's celebrate. But that's no true. We're suffocating on debt. Those homeless people living in cars or motels represent a tiny, tiny, minority of people in New Zealand. We are not going to endanger our wealth and prosperity and change the entire structure of the economy to suit them. That would be stupid. You are exaggerating this problem. If it is such a tiny issue, why are we spending so much money on it? I did write "tiny minority of people" however we would need to spend a whole lot less money if people took responsibility for their lives and managed things better. Also many of the homeless people you see in downtown Auckland who cannot help themselves would have been looked after in institutions in the old days. >"I did write "tiny minority of people" however we would need to spend a whole lot less money if people took responsibility for their lives and managed things better." I basically used to think that until I actually spent a few years working in anti-poverty work. You could take kids out of situations where they'll grow up to be "people who don't take responsibility for their lives" and put them with a "good family in a good suburb", and lo and behold they'd be among the population who take responsibility for their own lives. But that is an undesirable and unpalatable solution. But they do grow up in terrible situations, and cycles repeat, and it is incredibly hard to break them. It's just not as simple as saying they don't take responsibility for their lives and they could manage things better. I was also shocked to hear (IIRC) the outgoing children's commissioner say a while back that impoverished kids today have only about a sixth of the support they used to...back in the days when John Key was a poor kid with a beneficiary mother, for example. I don't know how that breaks down, but it was shocking. Kate don't be so negative. National have a plan and if we could just give them another 30 odd years they will have housing, the environment and water quality all sorted by 2050. Most of National...plus many others...will have spent their ill-gotten gains by then......so a delayed reaction, is almost.....Inevitable. There are non so blind as those who do not see....the future. The same could be said about urban environments and water ways too Kate. Urban living and clean beaches/lakes and rivers don't always go hand in hand. - But it appears that is just fine by urbanites. So easy for people to blame a sector of society while at the same time choosing to ignore the contamination/degradation/pollution they themselves cause. Also so easy to put a broad brush stroke over every water way.... whether or not it is fact. Well, in the absence of meaningful policy action, the market itself might crash. I know someone very in the know who rates China as at 50% chance of crashing this year, and at least 80% chance of at least dipping in some sort of significant way. interesting study shows supply was never going to lower prices but instead add more fuel to the fire. I find it strange that we are apparently still to see the results of the Accord after 4 years. I think we have seen it - total failure. All that has happened is landbanking and flipping. The SHA should have been restricted to the owner at the time with a tight time limit in which to develop. This is nothing more than money making opportunities for the select few as usual. on the full profit made on the home as it was not their place of residence. When you know Mr Key is well aware of how this is done in Nth America where he was a WallSt banker & on the NYC FED you wonder why this paradigm was allowed to roll on for years and years ? Why should Chinese be allowed open entry Visas into NZ to come and go as they please if not a permanent citizen ? after completing their studies ?